My name is Jumpei Ohtsuka. Before I was born there were a few thoughts as to what my name would be. In the end, the chief priest of Asama Shrine in Shizuoka named me “Jumpei”. The instrument I play, shō, is often played at shrines, and I wonder if the bond started then. Jumpei means trustworthy/wholeheartedness and calm/peaceful. Age: I was born April 1983 and I am an Aries, and the shō musicians I respect the most, Hideaki Bunno and Mayumi Miyata, are also both Aries. Provenance: I was born in Shizuoka city, Shizuoka Prefecture, nearby is the most beautiful scenic area named Miho No Matsubara (Miho Pine Grove) – which is the location of the legend upon which the Japanese Noh drama Hagoromo is based and the inspiration for a famous Japanese gagaku (Japanese court music) piece called sugura uta that I play often. How long have you lived in TOKYO? Since April 2002, when I started university. Occupations: When majoring in music theory at the beginning of my university days, I studied music from all over the world. Gradually I began listening to music of different ethnic groups in search of more and more original/primitive sounds. I learned to play the didgeridoo, a wind instrument developed by the Indigenous people of Northern Australia. I was particularly interested in music which uses the voice such as Tuvan/Mongolian throat singing or throat harmony. My final dissertation for my degree examined the chanting of Buddhist sutras. I had a deep interest in how chanting unifies spirit and mind, which let me to further study of Buddhism. During my time in university, I had the opportunity to work with a shō musician while performing gagaku (Japanese court music), which is a type of Japanese classical music that was first performed at the Imperial Court in Kyoto (from 794 AD) and is currently still performed at Tokyo’s Imperial Palace. The sound of the shō blew me away and changed my life. (Shō was brought to Japan 1300 years ago from China. It is believed that the sho origin dates back even further, up to 3000 years ago and the sound and shape is supposed to resemble a Chinese phoenix resting its wings In English it would be referred to as a “mouth-organ” and it is structured just like an organ, however, it produces a distinctly Japanese sound. Like a light shining down from above, it’s sound is unique and mysterious. After graduating from university I began my journey towards becoming a shō musician by entering another college that had a course dedicated to gagaku (Japanese court music). These days I am active in a variety of things, performing everything from traditional music to contemporary, from western music to ethnic music, collaborating with instruments from other genres, as well as improvising. The venue can vary from a concert hall, an art gallery, a temple or a shrine. Passions and Interests: I am curious about what resonates with people, what does music mean to them? Musician or not, all of us are living humans, and we all reverberate. Maybe other living beings, plants and places do as well? I think musical improvisation expresses the world’s harmony. I also love Japan’s pop culture, including music, (hip-hop & rap) movies, books and manga (graphic novel). I am a big fan of Kentaro Miura who is famous for his dark fantasy manga “Beserk” and I think manga is something that Japan can show off to the world. My favourite author is Haruki Murakami, Japanese rapper is Chinza Dopeness and artist is Akino Kondoh. What do people know you for? I imagine it is for being a shō performer. Even in Japan’s traditional music circle, there are only a few shō performers and a lot of Japanese that have never heard of the shō. That’s why I hope to bring the music and sound of the shō to a broader audience by playing in more informal settings. Thoughts on Tokyo A place where you question who you are. For better or for worse, Tokyo is an environment of people. People with really interesting values and people of all social classes gather here. It may seem stifling, but it also what makes day-to-day life more interesting. I was introduced to Jumpei through a Japanese photographer Mikan, who very kindly introduced me to many interesting people in Tokyo. I arranged to meet Jumpei at Yoyogi Koen (Park) which is close to Meiji Shrine and Harajuku station. 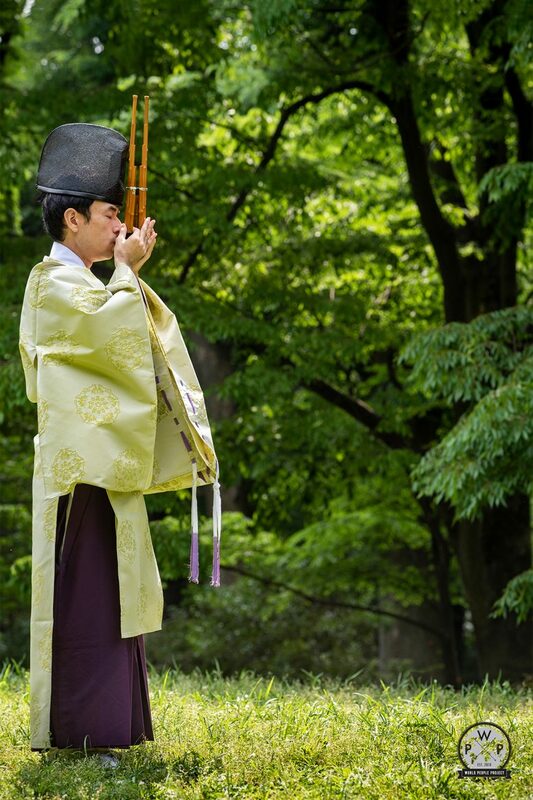 He brought the formal Japanese court clothes that are traditionally worn while playing the shō. I tried to keep the background free of people, a few office workers came by to eat lunch on the grass. It was beautiful to hear the instrument played, and what was interesting is that before and after it is played it has to be heated, to clear the pipes of moisture. Traditionally I believe a charcoal brazier would be used, but Jumpei carries a portable small heater to do the job. If you enjoyed reading this conversation with Jumpei please send me an email, I always love to hear your thoughts and comments. Listen to Jumpei’s music – it will transport you to another world.